We interviewed Ralf Fuecks during his visit to Los Angeles.Ralf Fuecks is President of the Heinrich Boell Foundation. ‘Green Growth, Smart Growth’ outlines a way forward in this great transformation, and does so in the conviction that the dangers posed by climate change can be overcome through a new approach to economics, innovation and proactive policymaking. Expert Perspectives on German "Energiewende"
Is the Cost of the German Energy Transition Threatening Industries in Germany? What Challenges and Solutions Lie Ahead to Reaching 100% Renewable Power in Germany? Gil Friend shares thoughts about the City of Palo Alto's 100% carbon neutral electricity portfolio achieved with renewable power purchases and renewable energy credits, along with a vision for the future. We met with Allan Jones to learn about the city's ambitious plan to cover all their power, heating, and cooling needs with local renewable resources by 2030. Founder of the Right Livelihood Award and World Future Council. Shares his thoughts on "Why Go100% Renewable Energy"
Participants in the 2013 Pathways to 100% Renewable Energy share thoughts on why it is imperative to transition to an all renewable energy mix. Speaker at the 2013 Pathways to 100% Renewable Energy shares his thoughts on Why Go100% Renewable Energy. How can renewable energy help developing countries like Africa? The 100% renewable energy revolution is not only about how we can and are producing electricity renewably, but about how doing so is a right being claimed by "energy rebels" on both sides of the Atlantic. 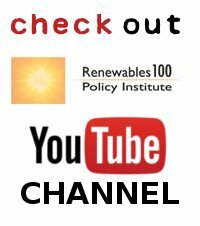 Thoughts on transitioning to 100% renewable energy - Is solar really part of the solution? Are batteries really sustainable? 100 percent renewable energy: not just a vision, but a necessity.